I love the 1950s era as it epitomizes grace and elegance, while being flamboyant and glitzy, as depicted by movie stars, Audrey Hepburn in breakfast at Tiffany’s and Grace Kelly. This fashion era has been the inspiration for my latest creations, which will all be available in my Etsy shop for custom order only. Dress these up by adding red lipstick, pearls and high heel plus a lot of attitude and you too can be a true 50s diva. 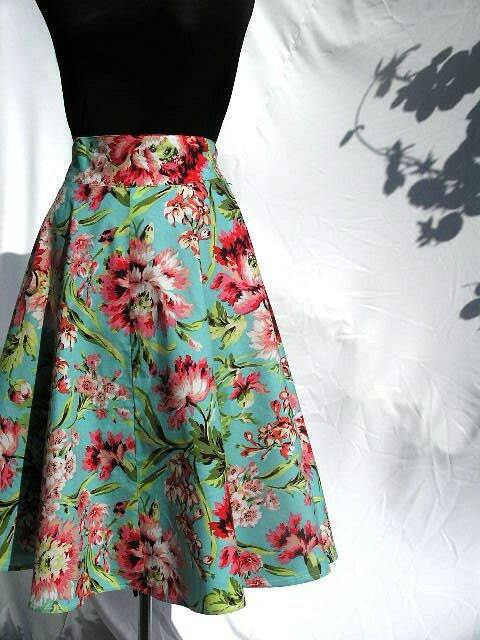 Rhapsody is a vintage inspired full circle skirt, made in a bright floral fabric with hues of aqua, red and green. The Forest Green Print skirt and the Merry Go Round skirt is a shorter version of the Rhapsody Skirt. The Merry go Round was a custom order for a client, she choose the fabric, you may recognize it from my shop (the Merry Go Round Sundress), I must admit I would not have even considered this fabric for the skirt, but I must say it really look great. I would love to hear what you think, which one is you favourite, which one would you wear. Oh, these full circle skirts are lovely, as are the patterns and prints! So summery! Your skirts are cute and flirty! You know, I have never heard of a Merry Go Round skirt. Now these are my kind of dresses. I love the first one! Thanks for stopping by and your comment. Always a pleasure to see you too. Thanks for stopping by my blog. Oh, I LOVE your clothes. I would wear all of these skirts. The fabric prints are divine! I love those 50's and 60's designs they wear on Mad Men. I also love hats. I love the dove grey one!